As you all know, I’m a total girlie girl. Anything pretty, pink and/or girlie and it has a magpie like affect on me! I love things that make me feel really girlie, and if you read my recent post about why I loved growing up in the 90′s, then you will know that I’ve always been this way. When I was little, I always loved Barbie dolls – the epitome of childhood girliness, and anything especially feminine. And just because I’ve aged, it doesn’t mean that’s changed – in fact, I embrace my girlie roots more than ever now! 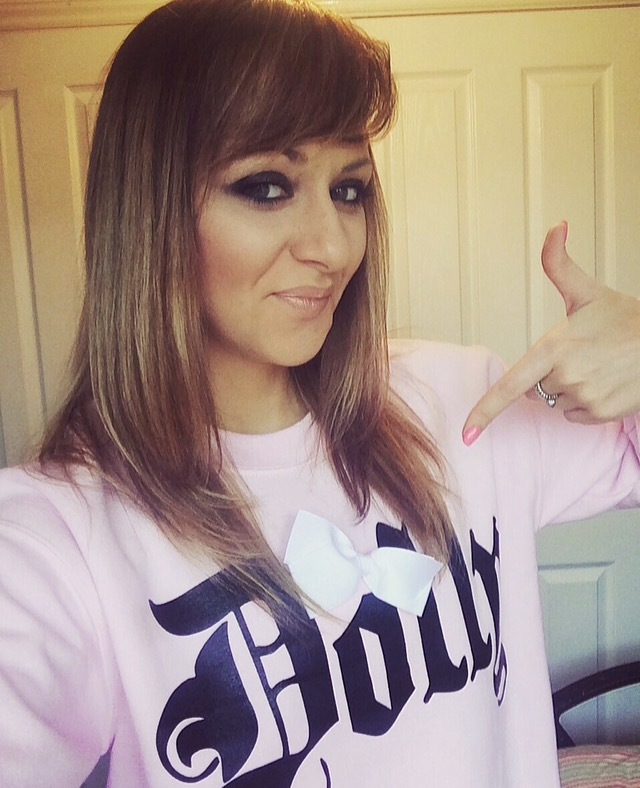 I just spend my money on clothes and make-up instead of dolls..
Dolly Rockin’it are the most amazing girlie clothing brand that I’ve ever found – yep, ever. If you’re looking for something that tells the world you love all things girlie then these guys are a brand you want to be checking out! Their stylish logo adorns all of their items, but the item they are the most well known for is their sweaters. These bad boys are so popular that you have to get in quickly when they’re in stock, as they regularly sell out completely and you need to pre-order. That’s just how popular they are! I think it’s because their signature logo is so girly and appeals to those ladies (like me) who live for this kind of brand. Their sweaters feature a silhouette Dolly on the front, and on the back, and both have a really cute detachable bow for extra girliness, as well as the logo on the bottom of the back. There is a huge choice of colours to pick from, but obviously mine had to be pink – no brainer. But if you’re looking for something else they have grey, blue, black, fuchia and more to choose from, so you can get whatever colour suits you the most. The silhouette style is the same on all colours so you can even invest in one of each! The sweaters themselves have a really comfortable fit, the lightly elasticated bottom means that the sweater sits nicely on your hips and looks great with jeans. It’s also super soft inside, and I can tell you first hand that I hate taking mine off after a day of snuggling away wearing it. The quality is really good as well, and they wash and dry without any problems. Mine is worn quite ofetn – I’ve even recorded a YouTube video for a charity in mine, and I can be quite tough on my clothes – just the normal day to day activities, but my sweater is lasting really well so it’s worth every penny! The ultimate symbol of girliness, these sweaters are one of my favourite things and I always get compliments when wearing mine. In fact, I’ve already asked Santa for another one in a different colour, just because I don’t think I can have too many..
As well as the sweaters, you can also buy the silhouette bearing Dolly’s on bags, hats and dresses. AND if you have a little lady in your life, they sell matching children’s sweaters too – so you can match! Such a sweet idea. 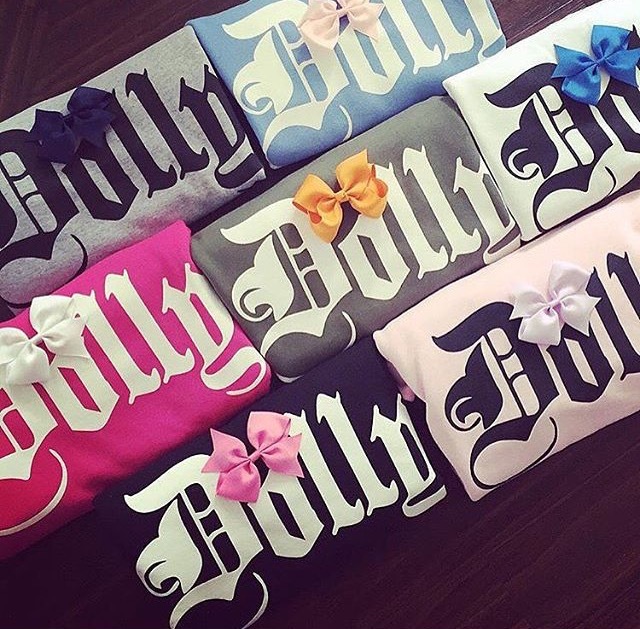 So if you’re a fan of loungewear, being comfy and looking girlie then make sure you ask Santa to make a stop at Dolly Rockin’it before visiting your house on December 25th!